← Is this not proof of a crime and a cover-up? On June 20, 2018, I filed two sworn “Informations” in the PEI Provincial Court: the first document alleges that the former Liberal Premier of Prince Edward Island, Robert Ghiz…. 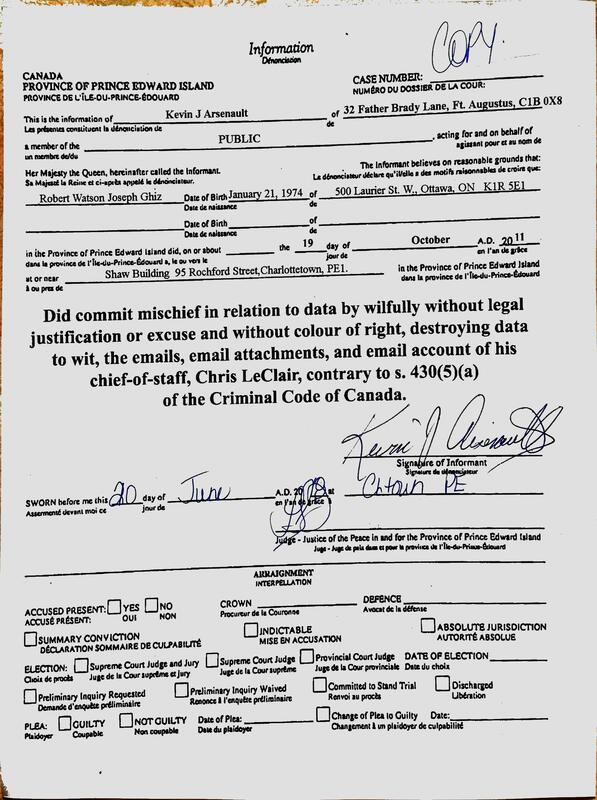 Did commit mischief in relation to data by wilfully without legal justification or excuse and without colour of right, destroying data to wit, emails, email attachments, and [the] email account of his Chief-of-Staff, Chris LeClair, contrary to s. 430(5)(a) of the Criminal Code of Canada. The second document alleges that Robert Ghiz…. 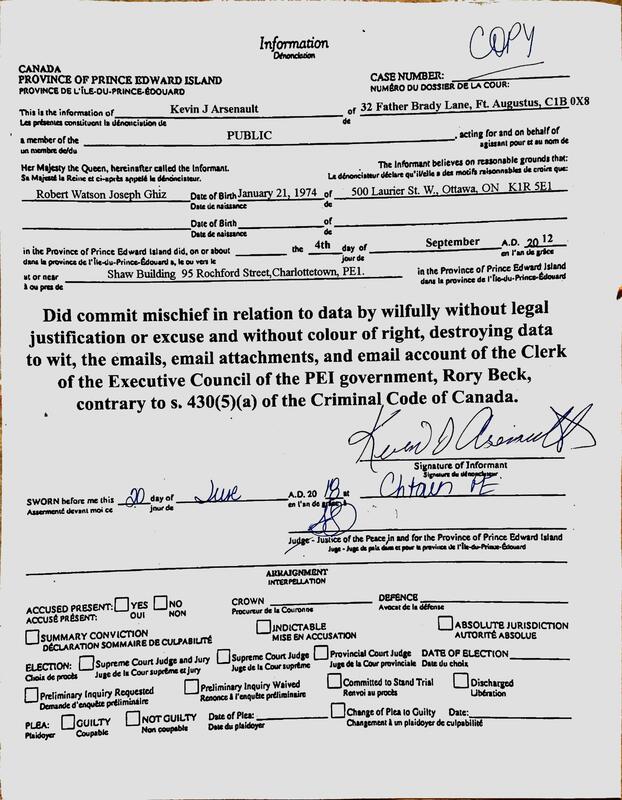 Did commit mischief in relation to data by wilfully without legal justification or excuse and without colour of right, destroying data to wit, emails, email attachments, and [the] email account of the Clerk of the Executive Council of the PEI government, Rory Beck, contrary to s. 430(5)(a) of the Criminal Code of Canada. This filing initiated a Private Criminal Prosecution, which is authorized under section 504 and 507.1 of the Criminal Code of Canada. Five days after my filing [June 25, 2018] Chief Judge of the PEI Provincial Court, Nancy Orr, issued a memo to all Provincial Court staff, Justices of the Peace and Provincial Court Judges re: Private Prosecutions – Criminal Code of Canada, explaining the process and procedural rules governing private prosecutions. The pre-enquete is an in camera and ex parte hearing involving only the informant and his or her witnesses, and the Crown and its witnesses, if any. This means it is not open to the media or the public and the accused is not at the hearing. The onus is on the private informant to establish that a summons or a warrant should be issued to compel the accused to answer the charge. If the Judge issues process, the private informant can take the matter to court and conduct the prosecution. The Crown is not required to take on any specific role to assist the private informant. If the Attorney General determines it is in the interests of justice to intervene, the Attorney General may take over the prosecution and continue or terminate it as he or she considers appropriate. Once I submit a form indicating the names and number of witnesses I intend to bring to the Pre-Enquete hearing – which I intend to do early next week – the Attorney General [Crown] will then be given a copy of each of the two Informations, and will be provided reasonable notice of the date for the hearing by the Court. The Crown can attend the hearing, cross-examine my witnesses or call its own witnesses. Will the Attorney General allow a Judge to decide whether a trial should happen? As a member of the Public Accounts Committee looking into e-gaming, Hon. Jordan Brown, along with his Liberal Colleagues on the committee, used their majority Liberal status on the committee to repeatedly vote down motion after motion – from opposition MLAs on the committee – designed to bring key e-gaming players before the committee: Individuals who could have answered important questions about the e-gaming affair. Although he wasn’t at the time Attorney General – those committee meetings were held late 2016 til March, 2017, and Jordan Brown was appointed Attorney General in January, 2018 – nonetheless, as a result of Brown’s refusal to investigate the matter thoroughly at that time, many of those questions remain unanswered. Likewise, both Premier MacLauchlan and Attorney General Brown refused to answer questions PC Justice Critic Jamie Fox asked in the Legislative Assembly based on my investigative report into the destruction of e-gaming records. Despite the fact that Fox informed the Premier and Attorney General that the RCMP had candidly admitted to me during an interview that they didn’t understand the record management laws, procedures, policies and protocols within the provincial government – which would have made it impossible for them to determine whether reasonable grounds exist to believe that Robert Ghiz committed the crime of Attempting to Commit Mischief to Data – their only response was that the Liberal government had confidence in the outcome of the RCMP’s e-gaming investigation finding no grounds for criminal charges. At no time has anything that either the Premier or Attorney General said or done regarding e-gaming suggested either have any interest in discovering more about what really happened with the e-gaming file, the destruction of e-gaming records, or whether there are, in fact, reasonable grounds to believe criminal offences were committed. The role of the Crown is set out in the Criminal Code and in particular section 579 of the Criminal Code provides that the Attorney General or an instructed agent may direct a stay of proceedings at any time after an information is laid. This can be done before the commencement of the pre-enquete or at the commencement of the pre-enquete or at any time after. By allowing prosecution when the state chooses not to act, private prosecution may offer particular opportunities in combating corruption, when the criminal actor is part of the state, and state actors may be reluctant to bring cases. Crown counsel may intervene to take over the prosecution or withdraw a charge only after the court makes an order issuing process. Crown counsel may, however, enter a stay at any time after an information is sworn. Will the Attorney General file a Stay of Proceedings? Given that I have already sworn and filed Informations, and a criminal proceeding has commenced, the Attorney General could potentially issue a Stay of Proceedings before I even have an opportunity to present evidence to a judge. But what would possibly motivate the provincial government to act to prevent the judge from considering evidence and deciding whether a trial should ensue? One legitimate reason why a stay is sometimes issued is to provide the Crown with additional time to undertake its own investigation of a matter. That is what I was hoping would be the outcome of my own investigative research and report – to have the completed RCMP investigation reopened, or to spur the provincial government to take action along the lines of what was suggested by Jamie Fox in the Legislative Assembly, e.g. to bring in a third party investigator (such as the OPP) to revisit the matter. Given that neither the Crown nor the RCMP have shown an interest in undertaking any further investigation of the matter since my report was tabled in the Legislative Assembly, if the Attorney General was to offer such a reason for issuing a stay, it would be both pretentious and unbelievable. If the Attorney General issued a Stay of Proceedings before a hearing could be held, it would be universally regarded by Islanders as an attempt to prevent the matter from being fairly considered by a judge. Given that outcome, I honestly don’t believe the Attorney General would authorize such a heavy-handed attempt to thwart a legitimate legal process. Will the Attorney General Intervene in a Criminal Prosecution? A criminal “proceeding” commences when an Information is laid; a criminal “prosecution” commences when a judge decides – following a pre-enquete hearing – to issue a summons, or an arrest warrant, to compel the accused to appear in court to answer a criminal charge. As noted above, the Attorney General can “intervene” and assume control of the prosecution only after the judge decides to commence a prosecution. Given the appearance of at least a potential conflict of interest with the Attorney General and PEI Provincial government – in that the current Liberal government would be assuming control of a prosecution against a previous Liberal Premier – I believe it would be unwise for the Attorney General to personally involve himself in this matter or direct the Crown to intervene and assume control of this private prosecution, especially if the intent was simply to withdraw the prosecution. Although the Attorney General can become involved in decision-making in relation to individual criminal cases, such practice would leave the Minister vulnerable to accusations of political interference. Accordingly, it is traditional to leave the day-to-day decision-making in the hands of the Attorney General’s Agents (the Crown Attorneys). [P 3-2]. If this is true for regular prosecutions initiated by the Crown; it is obviously even more important that the Attorney General recuse himself completely from this case and not issue a directive to have the Crown intervene in this private prosecution alleging a criminal charge against a former Liberal Premier. Let’s assume that no Stay of Proceedings is issued by the Attorney General prior to a pre-enquete hearing, and that the judge then decides that a prosecution is warranted. What might constitute “legitimate” grounds for the Crown to intervene and assume control of the prosecution? Luckily, the guesswork has been eliminated with this question, since those grounds are clearly articulated in the Guideline under the Director issued under Section 3(3)(c) of the Director of Public Prosecutions Act. Essentially there are two broad “categories” of reasons why the Crown would intervene: one pertaining to the nature of the prosecution itself; the other pertaining to the private prosecutor. • the prosecuting authorities have given the defendant a promise of immunity from prosecution. However, none of the above factors are at play in the criminal proceeding I have initiated, and I can think of no other legitimate reasons why the Attorney General would not want a trial to proceed if a judge was to determine that the evidentiary standard to warrant a prosecution was met in this case. 7. given the nature of the alleged offence or the issues to be determined at trial, it is in the interests of the proper administration of justice for the prosecution to remain in private hands. Again, given the optics and potential conflict of interest in this criminal proceeding, the #7 consideration is of particular significance. This particular Criminal Code Crime [Mischief to Data], although an indictable offence, is not a serious charge (e.g., “murder”); there aren’t any detailed or complex disclosure issues; the decision to lay a charge was not made for improper reasons; and the private prosecutor in this case has considerable past experience both initiating and conducting various types of legal proceedings. Since publishing my Investigative Report into the Destruction of E-gaming Records, I have heard from a number of lawyers – from both on and off PEI – who have told me they believe my report provides reasonable grounds for the laying of charges. One retired head of a major law firm told me he was shocked that it hasn’t triggered the reopening of the RCMP investigation, or action by the Attorney General. I would not have initiated this Private Prosecution if I had not been encouraged to do so by people who are themselves legal experts….my initiative may not result in a trial, but this action is neither frivolous or vexatious. As previously noted, I intend to file a document naming witnesses for the pre-enquete early next week. I will be shocked and extremely disappointed if the Attorney General issues a Stay of Proceedings preventing the hearing from taking place. If the judge conducting the hearing decides that the two-fold evidentiary test [(1) there is a reasonable likelihood of conviction and (2) the prosecution best serves the public interest] is not adequately met by the evidence I provide, then I will respectfully accept that outcome and that will be the end of the matter. However, if the judge believes the evidentiary test is met by the evidence I provide and issues process – then I would expect the Attorney General and/or his agents to allow me to proceed with the conduct of the prosecution. This entry was posted in Provincial Politics and tagged Criminal Code of Canada, e-gaming, Jamie Fox, Jordan Brown, Nancy Orr, Pre-Enquete, Private Prosecution, Provincial Court, Robert Ghiz. Bookmark the permalink. Red Hen: Justice will be done. It would really be a great thing if justice is served but knowing how the Liberals rally around themselves when under attack I ‘d be really surprised if old smirkey face Jordan Brown wouldn’t come up with some. Outlandish reason to justify his own insertion into any proceedings that should occur regarding this matter. It will really be interesting to follow along with you Kevin. Will be following this with interest, Kevin. Good for you!! Finally, someone who is speaking the truth, who has the necessary legal knowledge to let the rest of us know what should really be happening. Well, Kevin, join the NDP PEI/Mike Redmond who initiated an inquiry into this issue and nothing happened. The RCMP dropped the ball and the govt continued to make sure nothing further happened on yet another govt / liberal corruption scam. Yeah, and for the PCs to talk about this with such outrage, huh, give me a break. They, the blue cats, did the very same thing when they were government. Not to sound too bitter might i also mention how dismissive govt officials and members of the chattering class were when Redmond and the NDP PEI did take steps to out these crooks? Heck, even some New Democrats and Greens were critical with scowlings behind their hands. Don’t expect much support in your current endeavours. Islanders know careers can come to a screeching halt if certain boats are rocked too much! Good on Mike Redmond and Kevin. When will our Justice system actually work in the public interest, instead of acting as a tool to protect those in power who break our laws?